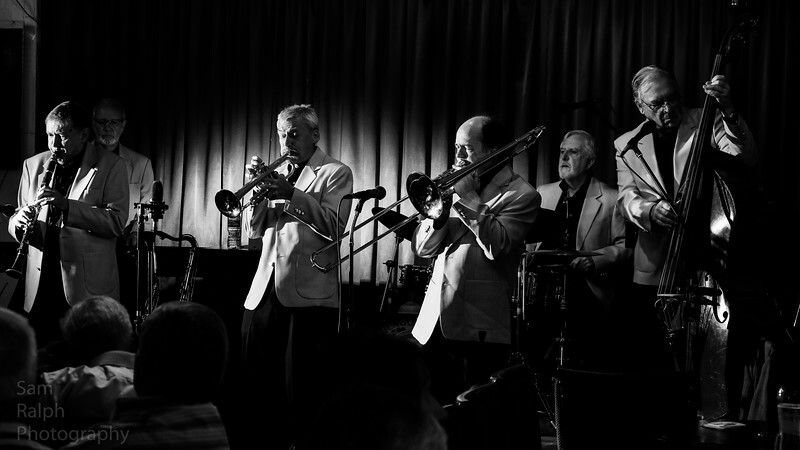 Rochdale jazz club gets together once a fortnight to be entertained by visiting traditional jazz bands who entertain and delight the members with songs that come from the deep south in New Orleans . I enjoy going along and take photos to get a visual record of the band playing their music. I shoot the photos while the band play, I like to shoot in black and white for the most part to try and capture the atmosphere and feeling of the night. If you ever pop down to the club look for the guy with the camera and say hello the address is below and the dates of the gigs are on the website listed below. The bands come from all over the country to play at the club and even though it is only a small club when you get a six piece band banging out those old tunes with a three piece horn section blowing those blues it's hard not to be impressed and enjoy the skill and artistry of the musicans playing tunes from a long long time ago. If your interested in the traditional jazz scene there is a fantastic website with news and lots of information about traditional jazz run by a huge jazz fan called Fred Burnett the link for his website is below. Aslo another great source for information about the jazz scene and live gigs around the country is Jazz Guide and again the link is below.